Do you know how to make homemade upholstery cleaner? Which cleaners are safe for your upholstery? How to get out tough pet stains? These are subjects that we knew little about, so, until recently, we purchased commercial products and hoped for the best. However, we have been trying to avoid chemical cleaners that may have harmful ingredients, especially in my home where my kids spend so much time. We want to know that the cleaners we use are safe for my family and pets, but we also want to know that they will do the job. 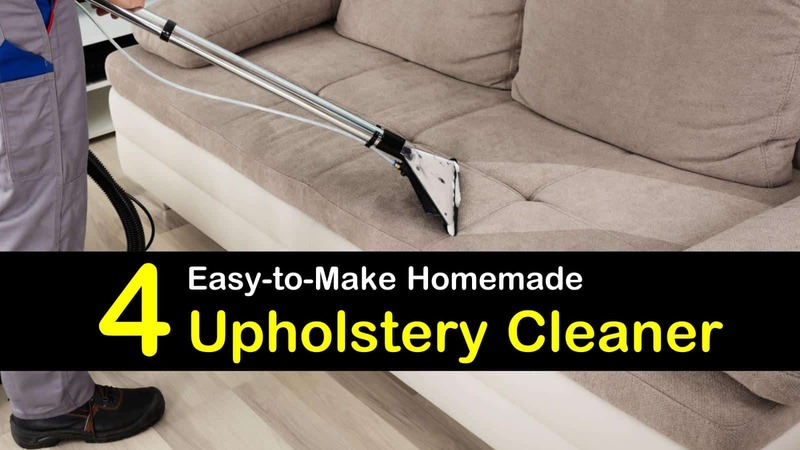 One thing that we hesitated about was a homemade upholstery cleaner, mainly because we didn’t always understand the cleaning instructions for each piece and we didn’t want to risk ruining an expensive piece of furniture. So, we have done quite a bit of research and testing, and we are ready to share what we have learned. Before you apply any cleaner to your furniture, understand the manufacturer’s recommendations for the materials used. Many of us purchase a recommended brand of commercial cleaning product because we know that will be a safe choice. However, all you need is to understand which cleaners are safe for your furniture, then choose the best upholstery fabric cleaner recipe. The key to choosing the best natural upholstery cleaner is understanding the cleaning codes. Codes that contain a W, such as SW, W, WS, and WW, are safely cleaned with water-based cleaning agents and will be safe to use with all the water-based cleaners listed here. Before you use any cleaner, do a spot test. Choose an inconspicuous spot on your furniture. This could be on the underside of the furniture, or maybe in the hem or on the back of the furniture. You want a spot that is rarely seen, just in case your cleaner fails the spot test and causes a stain. Once you have chosen your spot, apply a small amount of the cleaner and follow the instructions for cleaning the area. Allow the cleaner to dry and check for stains. If the area looks clean and you see no rings or spots, you can proceed with cleaning the furniture. One of the best homemade upholstery cleaners, especially for spot cleaning, is soap foam. Sidenote: This recipe is also the base of an excellent DIY carpet shampoo. Make the foam by mixing six tablespoons of soap flakes and 1 pint of boiling water. Let the mixture cool until it forms a gel, then whip it with a mixer or immersion blender until a head of foam forms. Apply the foam with a cloth or brush, scrubbing the upholstery to lift the stain. Re-whip the soap gel as needed to make more bubbles. Wipe the foam off the upholstery with a damp, not wet, cloth. You want to remove the soap without soaking the fabric or microfiber couch. Pet urine stains and odor can quickly ruin your furniture, but with proper cleaning, it can be salvaged. You have two important goals when cleaning pet urine on upholstery. First, it is important to soak up the urine without driving the urine into the cushions or fill material below the fabric. Once the urine soaks into the stuffing below, you may never get it out. Second, you need to get the urine out of the fabric immediately. Extract the moisture by blotting the area with paper towels or cloth. Rubbing can spread the stain. If you have a shop vacuum, you can also use it to remove the liquid before it can soak in. Place a dry cloth on the spot and allow it to dry completely before you begin to clean the spot with our homemade upholstery cleaner for pet stains. Mix the water and vinegar. Use it sparingly to dab at the stain, dampening it, then lifting the moisture with a dry cloth. If you add some hydrogen peroxide it will even take any odor away. Avoid soaking the material; you don’t want to drive the urine into the underlayer. Repeat the dabbing and drying until the stain is gone. The next step is to sprinkle the stain with baking soda. Cat urine is acidic and can run the fabric. The baking soda not only neutralizes the acid, but it also helps deodorize the fabric. Work the baking soda into the fabric and let it dry, then vacuum it away. Repeat the entire process if any stain or smell remains. To make a simple car upholstery cleaner, just use some basic household ingredients. Mix club soda, vinegar and dish detergent with some drops of essential oil and you will have an effective cleaning solution. For cleaning your car upholstery, you will need a shop vacuum or a steam cleaner, a spray bottle, a scrub brush, and our car upholstery cleaner. A slight variation of this recipe can also be used as DIY car carpet cleaner. Spray the cleaner on the upholstery generously and allow it to soak in for 3 to 5 minutes. Scrub the stains in small circles to lift the dirt, then either spray the area with water and vacuum it up or steam clean the area to rinse out the cleaner. Allow the area to dry. The vinegar smell is strong and may take a few days to air out. Using the essential oil helps the smell, but you can leave it out if needed. You can also use other essential oils if you don’t like citrus. You can use any dish detergent, but do not use laundry detergent. I prefer a good degreasing detergent. Please note: Do not use this cleaner on leather car seats. Find tips on leather cleaning on our special homemade leather cleaner recipes here. This is a quick and easy cleaner to make and it is the best upholstery cleaner for removing stubborn stains such as ink. It is also one of the best upholstery cleaners for a sofa, couch and chairs. Do not use this cleaner on furniture with a designated WW cleaning code. The rubbing alcohol dissolves many stubborn stains and white vinegar gets the rest. The essential oils are optional, but they give the cleaner a pleasant smell. Combine all the ingredients in a small spray bottle and set the spray for mist. Spray the spot and scrub with a clean sponge or microfiber towel. Repeat spraying and scrubbing until the stain is completely removed. Allow the spot to dry. For any stain, it is important to spot clean the sofa or textile as soon as possible when spills happen, then do a complete cleaning when it is convenient. Once a stain has set in, it will take more work to get it out, so a fast response is preferable. 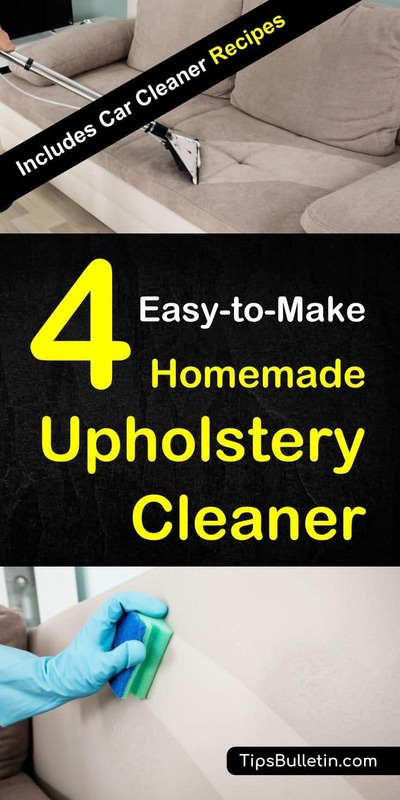 You’ll find that these four upholstery cleaning solutions will take care of most of the stains that happen during normal everyday use. I hope you will give them a try and let me know how they work for you. If you find them helpful, please share this article on your social media so that others can benefit.